Milwaukee Road 261 North Kansas City to Minneapolis via Lincoln and Sioux Falls. Following a summer when I was not hired by Amtrak again as a train attendant and a wonderful summer school job working with Joan Smith at Century High School, I had an opportunity to ride the Milwaukee Road 261 steam excursion from North Kansas City to Minneapolis. The route would be all new mileage except for twenty seven miles in Nebraska that the California Zephyr takes plus as a bonus we would spend one night in Sioux Falls, South Dakota allowing me to get that state on my rail map. Once confirmed that I was on the steam trip, I had John Balaty, our Santa Ana night agent book me on Amtrak on two circle trips. The first via the Texas Eagle with an hour forty five minute window to connect with the Empire Builder. Then fate took over as the Sunset route fell apart again with trains running eight to ten hours late with passengers being bussed from San Antonio to Dallas or put up in hotels to wait for the next day train out of San Antonio so it did not look like a good idea to go via the Texas Eagle route. We redid the first segment via New Orleans with John joking that I would be going to New Orleans in Hurricane Season. I laughed saying, "The only hurricane I have ever been in was Hurricane, Alabama!" I would then take the City of New Orleans, Empire Builder and Coast Starlight to home. Circle number two would be the Southwest Chief to Kansas City, the Milwaukee Road 261 to Minneapolis, Empire Builder and Coast Starlight home. On August 30th I boarded my customary San Diegan for Los Angeles for the connection to the Sunset Limited. We boarded the Sunset at the normal time but were held for fifty five minutes for our connecting passengers off of the Coast Starlight. Once we finally got under way, we left via the Metrolink San Gabriel Sub with a fast trip down the middle of the San Bernardino Freeway. We came to a twenty six minute stop at El Monte trying to contact Dispatcher 48 with our proper engine ID number. We stopped in Pomona only an hour eight minutes late before we pulled down to East Pomona and spent fifty one minutes waiting for four freight trains to pass. We finally made it to Ontario a minute short of being two hours late. We made it through West Colton Yard without stopping only to get nailed for twenty nine minutes at the BNSF Crossing at Colton. As I finally laid down across my coach seat my last thought was would we be out of California by sunrise? 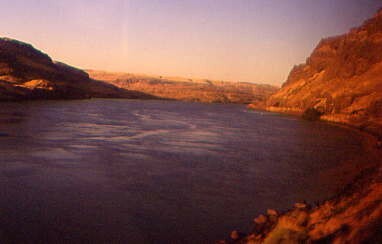 8/31/1998 I woke up in the Gila River Canyon just east of Yuma, so looking at my watch I figured that we must have been in Yuma about five thirty in the morning putting us about two and a half hours late. As I always have said before, "There is always an advantage to being on a late train." This morning's trip will be an all daylight run down the Gila Sub which will leave only the line east of Tallahassee to Baldwin as the only part of the Sunset's route that I have not seen in daylight. I headed to the lounge car for the trip through the Saguaro forest and southern Arizona. The Sunset made excellent time over this subdivision with all the freight trains tucked away in sidings out of our way. With no delays we made up ten minutes on our way to our servicing stop at Tucson. This trip I am reading John Grisham's "Rainmaker" so I sat deep in reading with the occasional glance out of the window. Other than fifteen minutes to flag blocks near Vail, AZ we lost no more time crossing the very green southeastern Arizona after the summer monsoonal rains. We did not stop at the flag stop of Lordsburg, NM a first for me and crossed the Continental Divide on a day with not a single cloud in the sky. We made excellent track time and made up an hour before we crossed the Rio Grande River into Texas and stopping in El Paso. Armed with a five o'clock dinner reservation, they made the call right after we met our westbound counterpart running about an hour late. The steak dinner was excellent and was followed by the movies "The Borrowers" and "Hope Floats" in the lounge car. I went to bed after Sanderson and slept all the way until San Antonio. 9/1/1998 We arrived in San Antonio two hours thirty minutes late. During the night we lost time after a total head end power failure while I slept. I got off on a morning with drizzle to get a newspaper to check Mark McGuire's home run chase of Roger Maris' record of 61. It was a new day so I chose King Crimson to listen to as we crossed central Texas as I read more of Rainmaker. The sky was becoming very interesting with clouds as we headed east. Just a week prior to my journey, Del Rio got clobbered by a tropical depression shutting down the line causing the Sunset to be rerouted. What a difference I am feeling compared to that morning that led me to being thrown off the train in New Orleans. A quick prayer to the Lord thanking Him for my sobriety as we made our way to Houston and another servicing stop with my chance to add it to the list of stations that I've been inside of. We made it delay free through the Union Pacific's former nightmare of Houston and made up forty five minutes by the time we reached Beaumont we were only two thirty late as we exited the great state of Texas and entered Louisiana. Following Lake Charles where the poor Amshack station shelter needs a new roof and rear backing, it was time for another steak dinner from the excellent dining car staff of the Sunset Limited. As we neared New Iberia it was announced that "If anyone is heading west tomorrow please be advised that Hurricane Earl is expected to hit the coast at New Iberia tomorrow at 11:00 AM". Passengers were sighing a breath of relief thinking that they had escape Earl's presence. Darkness took hold as we crossed the Bayous towards New Orleans. The Sunset Limited crossed the Huey Long Bridge over the Mississippi River and now they announced, "The CSX railroad is imposing a fifteen mile an hour speed restriction on all trains along the gulf, so Amtrak is canceling the Sunset Limited east of New Orleans substituting buses for the train!" This told me that the hurricane had turned on a more northeastern path. How far east I would have to wait to find out? Passengers are rightly upset by this news but find comfort from my saying, "The buses will get you to your destination quicker and safely at highway speeds of seventy versus the forty the train takes for most of the trip." I detrained in New Orleans two hours twenty minutes late and got a taxi cab to my usual hotel wondering where Earl is? After checking in to the Maison St. Charles Day's Inn, I turned on the television finding the Mayor of New Orleans on telling the city that, "Earl is on a path straight for the city. All flood gates have been closed. The storm should hit the gulf coast about seven A.M. and the city about seven P.M. You may park on any street medium except the ones with trolley tracks. All schools are closed as well as all governmental offices." With that I crossed the street to a very busy store to get a new tape player as everyone else is getting supplies to weather out the storm. I returned to my room for a night of well rested sleep and a hot shower. 9/2/1998 The next morning on goes the television and Hurricane Earl had changed its track again, this time more northeastward and will miss New Orleans completely but will cause Mobile problems. 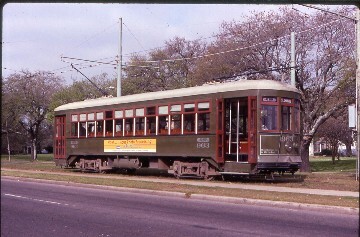 I opted for a ride on the St Charles Streetcar Line through a nearly deserted Big Easy with a steady northeast wind of about thirty miles an hour but there's very little humidity. Could this be the calm before the storm or just wonderful nice weather I have heard about before the storm hits? Once back at the hotel, I decided that since it was such a beautiful windy morning I would walk back to New Orleans Union Station and I saw only one other person out walking. Once at the station, I bought the usual postcards, a Subway sandwich and spent an hour writing all of the cards before I took a seat and watched Hurricane Earl updates before I boarded my next train. With me ready to head north to Chicago, Earl was aimed at the panhandle of Florida's coast. Under the hurricane scenario, if they would have kept the flood gates closed, the City of New Orleans would have been taken to Hammond prior to the gates closing and passengers would have been bussed from New Orleans to there. It would have cost me some miles but with the yard limits the train has to pass through, a bus would kill the train for that distance. I was very relieved when I saw my train but also the same Sunset Limited with the same crew ready to head back to Los Angeles. The crew in Florida for this train got to spend an extra three days in the Sunshine State getting plenty of rest. Myself well rested and ready to go, I boarded my coach for the trip to Chicago. The City of New Orleans left New Orleans right on time and passed our southbound counterpart out by the airport before crossing the causeway at Lake Pontchartrain. I rode the lounge as far as Hammond seeing Charlie the Alligator at his home in Ponchatola before returning to my reading as the train headed north through the Mississippi forest. The train arrived early at every stop and had to wait with dwell time until the true departure time came. We arrived at Jackson early which allowed me to have a look inside the station. Heading north towards Yazoo City, I had a dinner of Chicken Fried Steak which was an excellent meal and a first on Amtrak. Following the stop at the fabled Yazoo City, tonight's movies were shown. The first was the sci-fi "The Sphere" and the second the Disney comedy "Meet the Deedles." We arrived in Memphis where the station is being rebuilt and I visited the subbing Amtrailer in place of the true station building. After a night time stroll along the train (we were early again), I returned to my coach seat and slept well into central Illinois. 9/3/1998 Waking up is always a question of where you are on the route and not knowing what transpired during the night in terms of operations so when we arrived in Rantoul, IL, we were early again thus proving to me how well the Illinois Central handles trains. My breakfast of cookies and tea put me in a great mood as the train sped north across the Illinois countryside. We paced a Metra electric train through Homewood, entering the St Charles Airline with the great views of downtown Chicago before we backed into Chicago Union Station ten minutes early. During my layover in Chicago, I took a Metra train to Aurora, did the post card thing, Char Dogs at Gold Coast before heading to the north waiting room to await my next train. I met Thomas McCain of Oregon Operation Lifesaver Program which helped to kill the time until boarding. There is a Northwest Airline strike going on and Amtrak loads two cars full of the airline passengers before they load the true company's passengers. In spite of all kinds of mass confusion, the train left Chicago on time. I was still reading the book as the Illinois countryside turns into Wisconsin and the train neared Milwaukee. West of town I saw both the old and new County Stadium where the Milwaukee Brewers play before I had another steak dinner. At Columbia, WI a college reunion group took up all the seats in the car in front of me going to East Glacier, MT for a two night stay. The other passenger is one I now wished had never been seated by me and here is why. This passenger sat down next to me reeking of Alcohol. I asked him where he was going and he said Tomah. I figured it was going to be a quick trip to Tomah so I excused myself and went to the lounge car taking a Jethro Tull tape along to enjoy the Wisconsin Dells. Amtrak showed "Hope Floats" again, so I listened to Tull until the tape ran out. I returned to my seat to get the Emerson Lake and Palmer live tape and found a whiskey bottle along with two empty beer cans laying on my seat which Amtrak does not sell. I moved his empties back to his seat, moved his bag back in front of his seat, got the ELP tape and returned to the lounge car. The Builder arrived at Tomah and I heard someone was being thrown off of the train. I went back to see if my suspicions were right and I looked out the coaches window to see the seatmate in handcuffs with two officers outside of the train. I checked my belongings finding them all there and thanked God that I was sober. I returned to the lounge car for the rest of the concert as the train pulled out. Upon the end of the encore, I returned to my seat and found my tape case is gone. My only question is how? As I know the who, what, where and when. I found the conductor in the dining car and after I explained what happened, he asked me to show him where it was. When we got back to my seat and I pointed to its former location. He asked in a very sorry tone, "Was it gray?" That sent a chill down my spine and when I nodded yes, he went on to explain that the drunk said he had left his computer on board and they came back up and got it. "Three things amazed me, one they took the drunks word about it, two, they did not open it to see if it was indeed a computer (with the rattle it had, it could not be) and three, they did not read the luggage tags on it with my name, address and phone number on it. They gave away my tape case with thirty eight tapes inside leaving me the lone ELP tape for 3,000+ miles. I found this really to be funny in an absurd kind of way and said to the conductor, "If that is the worst thing that happens to me today, it is still a great day!" We both had a good laugh at the whole situation and he said he will help me get them back. He wanted a description along with my home address so they can be sent to me. I complied and that is so funny. It is now in Amtrak's hands, the same hands that gave it away in the first place. I returned to the lounge car and found Thomas sharing a good laugh as we crossed the Mississippi River at La Crosse, WI and entered Minnesota heading north along the west bank of Old Man River. Time passes as conversation flows and after stopping in Red Wing, we crossed the river again to enter St Paul, passed the former Union Station before arriving at Midway Station fifteen minutes late due to track work on the Soo Line and our drunk. The Builder cut off the "Northwest Coaches" and the five road railers which had been on the rear end since Chicago. I made a quick trip inside the station to check out the services for my return in ten days before reboarding the Empire Builder and falling into a deep sleep as the Builder left the Twin Cities thirty minutes late. 9/4/1998 The sun shined brightly though the coaches window waking me up outside of Devil's Lake, ND. It was a beautiful late summer morning as we arrived at Rugby, the geographical center of North America. I listened to my lone ELP tape as I finished Rainmaker just before detraining at Minot for some fresh air, newspaper and to mail a post card. There is no mail box just a rack by the Amtrak counter for outgoing mail. I wonder how my mail is going to get to California. After crossing the high trestle west of town, I settled into my seat doing word searches until Williston for more fresh air. I see the Missouri River for the first time on this trip and it seems like an old friend after helping to teach Lewis and Clark to our students at Century High School. We entered Montana, lose the Missouri as we follow the Milk River west towards Havre. We made our Station Stops at Wolf Point and Glasgow before we met the eastbound Empire Builder, stopping long enough so a sick dining car staff member can detrain and return to Chicago and their own bed. We arrived in Havre, I learned how pronounce its name, photographed the Great Northern 359 and the Empire Builder. I took an early dinner, having you guessed it another steak so I would not miss any of the mountain scenery. Leaving Cut Bank, the Rockies came into view and when the train reached Browning and turned north, great plumes of smoke can be seen from the Challenger Fire in the Flathead National Forest just south of Glacier National Park and our crossing of Marias Pass. After crossing the lofty Two Medicine Bridge we stopped to detrain the group at East Glacier where I spotted a grizzly bear on the golf course definitely not taking up the sport. The Rockies were back lit yet still extremely beautiful as we crossed Marias Pass. As the train descended the west slope flames from the Challenger Fire became visible while at Blacktail the BNSF was cleaning up a major grain train derailment. The train ducked in and out of the snow sheds as the light of the day began to fade. The Empire Builder later passed my old favorite lodging, the Izaak Walton Inn. Tonight's movies were "My Giant" and "City of Angels." Following the conclusion of the movies and our passage through the Flathead Tunnel, I was ready for another good night of sleep. 9/5/1998 Sleeping soundly, I woke up outside of Pasco, WA having slept through all the switching moves in Spokane where we became the mini Builder to Portland. My plan is to just sit back and enjoy the Columbia River Gorge this morning and photograph it in ten hours. Our conductor is giving an excellent traveling PA talk about the gorge giving out plenty of new information such as Arlington, OR being the hometown of Doc Severson of the Tonight Show fame and that Tom Selleck was rumored to have bought an island in the Columbia River which he did not. It all added up to the color of the trip. Mt Hood had the least amount of snow on it I have ever seen but since its early September it is expected. The gorge is absolutely beautiful and after an excellent four hour journey down its length, I detrain at Vancouver to mail a post card and watch trains pass through including photographing my old friend, the Talgo train from Spain. My train back to Southern California departed Vancouver fourteen minutes late following a double spot at the station there. We crossed the Columbia River and arrived at Portland Union Station on time. I so do love padding in schedules. The Starlight headed down the Willamette Valley with Michael my train Attendant discussing Jethro Tull. Michael has an excellent voice. He used to be in a band and will be known as the singing car attendant. (He became the singing assistant conductor a year later). We lost twelve minutes at Hallowell waiting on 14 our sister train. Just before Eugene, they called in my dinner reservation and I enjoyed a Beef Tenderloin along with Chocolate Cake. Following dinner, I enjoyed the climb over Cascade Summit in the last light of the day. This evening's movies were "As Good as it Gets" and "Major League II" which the tape broke twelve minutes into it so they replaced it with the "Odd Couple II" The movie ended at Klamath Falls where we departed only to come to a quick stop as a passenger had left a bag on the platform and a crew member walked back to get it. Once on the move again, I return to dream the night away. 9/6/1998 The next morning, I woke up right outside of Roseville so I had my first views of the progress the Union Pacific is making rebuilding the Roseville Yard. We continued our trek to Sacramento with a long smoking stop while the engines were refueled. The Starlight made excellent track speed down to Martinez and a beautiful clear morning provided an excellent view along the Carquinez Straits and San Francisco Bay. We were held out of Emeryville so that the California Zephyr could depart on time. We stopped at the West Oakland Coach Yard to add a material handling car before arriving at the Jack London Square Amtrak Station. A Capitol train arrived and did its station work quickly to depart in front of us. It then became time for another listen to the lone ELP tape but this time found my fingers playing along and it brought the interests of a music student who wondered what my hands were playing. We got talking with me admitting I do not even play. He thought if he got a keyboard in front of me I could indeed play the music of ELP. I guess that is what happens after you hear something over and over again with my tape player going in circles just as I am doing! I am in a kick back and watch the world go by mood so it's just another trip down the former Southern Pacific Coast Line. Nothing perks my attention until we met number 14 at Santa Margarita followed by our descent down Cuesta Grade to San Luis Obispo. Following a smoking/watering/post card mailing stop depending on who you are or what you did, the Starlight headed to the Pacific Coastline. With the diner being open seating, I enjoyed another Beef Tenderloin and Caramel Ice Cream Turtle Cake as the Starlight traveled along the shoreline to Santa Barbara. Peter McNamara became our conductor for the trip to Los Angeles and we got caught up on things. We raced to Los Angeles finally meeting a nightmarishly late San Diegan 781 at Allen Ave before arriving at Los Angeles Union Station one hour and four minutes late. Amtrak held San Diegan 786 for the connecting passengers off of the Starlight and once we were underway, we were held for forty five minutes short of where San Diegan 774 had derailed earlier in the morning. Arriving at Santa Ana one hour three minutes late, my first circle trip was completed. I was home to bed for two nights and one day of work before I was back at the Santa Ana Amtrak Station to start circle number two. I was back at the Santa Ana train station waiting for San Diegan 583 when I heard its whistle which did not sound quite right. It came around the corner and I saw why. This day's San Diegan 583 was a set of California Cars and when I went upstairs I was surprised to find Linda Paul behind the bar. Each of us was wondering what the other was doing here. As it turned out, there had been a problem and all the train sets got out of their cycles but we were still both very happy to see each other. At Los Angeles we each went our separate ways, Linda down to San Diego on San Diegan 586 later this evening and me on Train 4 for Kansas City. It must have been a trip for seeing familiar faces as my car attendant was none other than Michael who I had seen three days ago on the Starlight. We left Los Angeles ten minutes late due to heavy passenger loadings, added the mail cars, waited at San Diego Junction for five minutes for train San Diegan 585 before we finally attained the mainline. Fullerton came and went while at San Bernardino we lost ten minutes for an injured passenger. I went to sleep after the summit of Cajon Pass and slept so soundly that I slept right through the removal of a drunken passenger at Needles which took thirty seven minutes to do. At least being sober I do not have to worry about that happening to me again. What would I have done in Needles? 9/9/1998 I woke up right before Williams Jct., AZ. Waking up in the forest of northern Arizona has always been one of my favorite ways to start a day. It always means I'm on another train adventure. I went to the lounge car to enjoy the early morning sunshine. Flagstaff is always my stop for a newspaper and with Mark McGuire breaking the major league home run record last night I was in a very good mood. I sat at my coach seat listening to another set of tapes, this one I am keeping well hidden. I met several other people who are taking the same Milwaukee Road 261 trip that I am and Robert Proctor, a member of the Orange County Railroad Historical Society on his way to three tours of Lighthouses of the Great Lakes. If that was not enough, later that afternoon I met the parents of one of my best friends, Bruce Fenton, on their way to Goshen, Indiana. It is truly a small world or as Billy Joel once said in concert, "Everybody in the whole wide world I know is here!" The former Santa Fe mainline is one busy place and it was not until we got to Dalies, the junction with the line to Albuquerque that we stopped sliding in and out between mainline freight trains. I spent the rest of the afternoon in conversation with various people in the lounge car as the train passed through Apache Canyon and made the grade of Glorieta Pass. I had a delightful dinner with Robert before I enjoyed Raton Pass and the rest of the daylight. I fell asleep after La Junta and slept through the stop and go actions of eight red signals and the wait to proceed past each one. This all took place just east of La Junta. 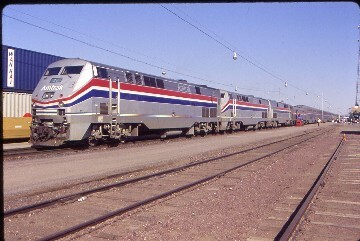 9/10/1998 I woke up outside of Topeka and enjoyed the morning ride into Kansas City in the lounge car. We arrived at Kansas City thirty seven minutes late. I taxied out to the Budgetal Inn in North Kansas City and while waiting in the lobby for four hours for my room to be made up, I met several other people going on the same trip as I am, staying here because it is close to the train's boarding site. Following check in, I walked with one of the future passengers down to where the Milwaukee Road 261 steam train was and did a little photography. For the reminder of the day I studied my BN timetables of the route that we would be taking over the next three days from North Kansas City to Minneapolis. The hotel was right across the street from the Norfolk Southern yard so I could watch their action right through the hotel window. I had a nice dinner, watched some television before I got a good night's sleep. There is an excitement aboard as the whistle blows and the train got under way for the start of our trip over the 202.2 mile St Joseph Sub of the BNSF. The reason for this whole trip is to get the steam engine back to the engine's home base in Minneapolis. The BNSF used the engine over the summer on their Employee Recognition Specials across the northeastern part of the BNSF system. It made an appearance at Galesburg Railroad Days and following the engine's duties on more employee specials it made the way to Topeka Railroad Days the week before our trip. As a way of saying thank you to the Friends of the 261, they decided to let the group run a public excursion to get the Engine home. This is the reason why I am aboard this train to get a whole lot of new mileage and routes along with the chance to ride a train in and out of South Dakota, the most elusive of all the lower 48 states to ride a train into. We have a BN SD-70MAC tucked in behind the tender for protection in case anything goes wrong with the Milwaukee Road 261. I had photographed along this line with Bill Compton, my good and baseball loving friend so I was familiar with the route as far as Weston. This is the main BNSF coal route from the Powder River Basin to Texas and the south and it will be interesting to see how the dispatcher handles our train through this coal funnel. Once on the move, we slowed towards the end of double track for a coal train to clear the main. We never stopped and near the airport we are at track speed heading north along the Missouri River to the west and the bluffs to the east as we traveled the river bottom lands. Since this trip is also operated by the Camrail Club of Nebraska, all passengers have access to the two domes so I ride in the ex Union Pacific car for a few miles before switching to the ex Northern Pacific car which was the same Dome car I had ridden east on the Capitol Limited on my first cross country trip. It feels so good to be back in my old friend. It was a beautiful clear September morning as we marched north passing two coal trains tucked away in sidings out of our way. We made really good time to our first servicing stop of the day at St Joseph, MO. Leaving St. Joseph, we headed northwest to Rulo and the crossing of the Missouri River also known as the Big Muddy into Nebraska. It was an impressive crossing as the train stretched out of Missouri into Nebraska. We ran unimpeded to Falls City where the train was serviced and the passengers were allowed to get off to photograph the train. I believe the main reason we were allowed off was to allow the switching of the school children who had been riding the train since Kansas City for the school kids from Lincoln who were about to board the train, many for their first train ride in their life. Once under way again, we made it to the first siding to the west at New Salem where we went into the 10,210 foot siding for an hour and a half to let six coal trains and one piggyback train head east. The funny thing was there was not one person complaining about this delay as everyone including me was enjoying the show the BNSF was putting on. Once on the move again, I was back up in the ex Northern Pacific Dome where I had the chance meeting with the owner of the car. The train was climbing up the new grade alignment over Firth Hill as BNSF had opened up this new second mainline here to eliminate a bottle neck on this important route. 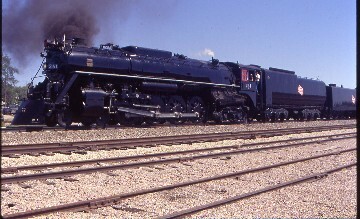 We arrived at Lincoln after passing the massive grain elevators, thirty minutes early thus ending the first day of the trip behind the Milwaukee Road 261. I took a seat right inside the shuttle next to the door and at the hotel I was second in line to be checked in. I was back with a KFC dinner by the time number eight in line was being taken care of. As I walked by with my food, I did point the folks the way to the food. I spent a restful night in Lincoln. 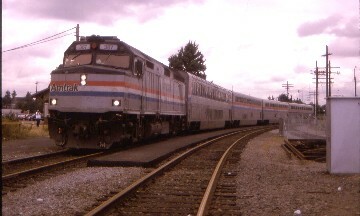 9/12/1998 The next morning, I took the first shuttle back to the train station getting to watch a two hour late California Zephyr pass through town on its way east before boarding the train of the Milwaukee Road 261 east for day two. I returned to the ex Northern Pacific Dome to enjoy the forty miles an hour speed through dark territory (no signals) over the new route. Everyone in the Dome is talking about how the 261 would be handled by the Union Pacific at Fremont, the crossing of its main east/west mainline. I am the only one who thinks that the UP will take the train without stopping us and several people want to bet me about it. As we neared, the approach signal to the crossing showed green, with everyone wondering how I knew. I did not, it was a lucky guess. After crossing the UP at Fremont, the 261 paralleled the Fremont and Elk Valley, a short line which runs a dinner train over its route which we crossed six miles later. The train then crossed the eastern end of the Sand Hills of Nebraska before reaching the Missouri River Valley at Dakota City. The route turned east prior to crossing the Missouri River and entered Iowa. High up on the bluff to the east was the Lewis and Clark Monument before we turned north to reach our watering and passenger stop at Sioux City, Iowa. Heading north out of Sioux City on the Marshall Sub for the next 94.9 miles to Garretson, SD as we continued our trek in dark territory. We paralleled an ex Rock Island north which kept my interests and made our way into the very southwestern corner of Minnesota passing through Sioux Center on the way there. 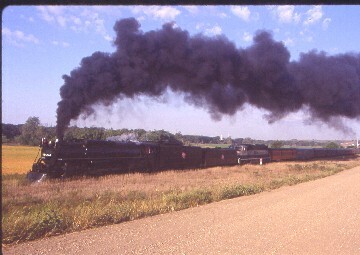 Once into Minnesota at Hills siding we were treated to a triple photo run by the Milwaukee Road 261 which put on a great show of steam and smoke. Once we were on the move again, crew members of the Friends of the 261 went through the train offering $50 for a steam cab ride into Sioux Falls or $20 for a cab ride in the trailing diesel. With me about to enter South Dakota for my first and maybe only time on a train, I paid for the diesel for two reasons. One, it was over ninety degrees out and the steam cab was really hot and two, the diesel would provide nice cool environment as it had air conditioning. The crew member took me into the crew car and I crossed into South Dakota, my forty seventh state that I had ridden a train in. Garretson, SD was where the train would be pulled backwards into Sioux Falls, since there was no turning facility. I boarded the SD-70MAC locomotive for my grand entrance into Sioux Falls. The BNSF crew left me alone, telling me only, "Chris, you can blow the horn and ring the bell anytime the 261 does. Have a really good time and we want to really hear it in Sioux Falls." Once the local's power had coupled onto the rear of our train, we were pulled backwards towards Sioux Falls down the BNSF Garretson Sub. The sun set in the west bringing to the end another great daylight of train riding. We arrived in Sioux Falls after dark, with me adding to the noise of the Celebration of the Milwaukee Road 261 arrival in town. We were pulled past the station where we were supposed to stop and went into the yard where there was room to hold our train. After another great day of steam train riding and a longer walk to the hotel, that night I went to bed knowing that I had completed the goal of riding a train into South Dakota. That was the hardest state to ride a train into. The final day of the 261's trip dawned bright, clear and warm with everyone who had been abroad all three days ready for our last day together. The 261 left Sioux Falls on time and near Corson it performed a double photo runby for all of us. Once we returned to the Marshall Sub at Garretson, we made our exit out of South Dakota back into Minnesota a few miles later. The train headed in a northeast direction along Minnesota Highway 23 from Jasper to Willmar providing some entertainment watching people trying to drive and watch the train at the same time. The train passed through Camden State Park, a really beautiful area along our route and a total surprise. We made a servicing stop at Marshall before we headed to Granite Falls where we crossed the Minnesota River. We reached Willmar after running 127.3 miles from Garretson. From here, the Milwaukee Road 261 and train headed directly east down the ex Great Northern line towards Minneapolis with US Highway 12 for most of the way. We passed many lakes, the most famous one was Lake Minnetonka before entering the suburbs of Minneapolis. The 261 made its way through the west side of the city before heading to its home base where we all detrained, ending the longest steam train excursion of 1998 with not one video producer covering the trip. As I waited for a taxi to take me to the Amtrak station, I thought just how lucky I truly am to be sober and standing this moment in the Twin Cities plus the fact I reached South Dakota along with all the new miles and memories I now have from this fantastic trip. I really feel pretty special at this point in my life. I shared a cab with two people going to a hotel before I got a ride to the Amtrak station for free. I stored my bags, walked over to the Minnesota Commercial Railroad for some pictures before finding something to eat and returned to Midway Station to wait for the Empire Builder and the continuance of my second circle. After waiting all evening, I was really glad when the Empire Builder showed up in Minneapolis and I boarded for a good night sleep after a three day fantastic ride behind the Milwaukee Road 261. 9/14/1998 I was up ready for another full day of train riding in North Dakota but this time with an assortment of tapes to listen to. We are an hour late as the train entered Montana and other than that this trip was identical to the one ten days ago. We are an hour late and other than that this trip was identical to the one ten days ago. As we approached the Rockies, there was another great plume of smoke rising into the Big Sky of Montana and I could tell it was in the Flathead National Forest, south of Glacier National Park. Being an hour late made it totally dark before the Izaak Walton Inn and with the passage of it I turned in for the night. 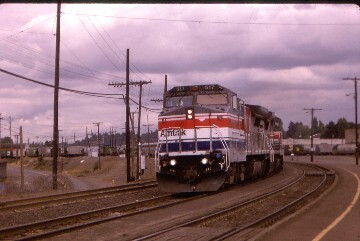 9/15/1998 The next morning, I awoke just as we were leaving Pasco and made my way to the Sightseer lounge car with my camera for the trip down the Columbia River Gorge. The brilliant sunrise started the picture taking and I spent a delightful morning of train riding and photography all the way down the Columbia River. At Vancouver, I detrained, did the post card and Talgo thing on this fine September morning. Boarding the Starlight, I am in my I just want to get home mood, I settled into my coach seat and enjoyed the crossing of the Columbia River into Oregon and Portland. After Portland I napped for a couple of hours awakening to get the earliest seating for dinner. My now usual Starlight Dinner was excellent and following the climb up Cascade Summit, I watched the "Odd Couple II" and tried again to watch "Major League II" and for the record it did not work this time either so as we pulled into Klamath Falls I decided to call it a night. 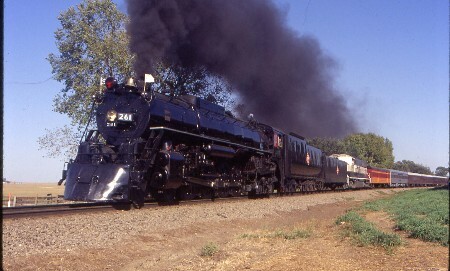 9/16/1998 The next morning, I woke up north of Roseville and went to the dining car for breakfast. 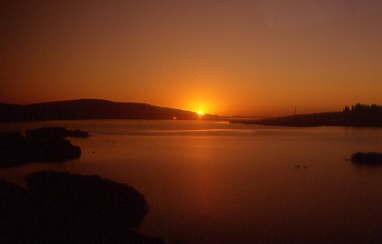 I was for some reason very tired so after passing the Carquinez Straits, Oakland and San Jose, I slept from there until we passed Salinas. We were about thirty minutes late and made up five minutes of that by the time we had reached Paso Robles before we came to a stop for what could only be called a Phantom Slow Order. No workers, no authority, no nothing just red boards stopping us dead in our tracks. The Starlight sat for over an hour while the head end crew attempted to get permission to pass which the dispatcher finally gave. It was a full hour that never could be made up as at San Luis Obispo they made a longer than normal stop. The only saving grace was the excellent dinner the Starlight's dining car staff served me. At Santa Barbara, Peter McNamara told me I had a 50/50 chance of making my San Diegan if nothing else happened. At Oxnard we lost twenty more minutes and a few minutes later it was announced that San Diegan passengers would be bussed to their destinations. The Starlight rolled into Los Angeles at 10:20 P.M. and I was put on a bus that stopped in Fullerton and Anaheim with me having to give the directions to the bus driver on how to get to there before arriving in Santa Ana. My round in circle trips had come to an end and that now leaves only the states of Alaska, Oklahoma and Hawaii left for me to ride trains in. Note: Conductor and friend Peter McNamara passed away suddenly on Wednesday, October 31th, 2001. I got to know Peter really well when he was my night time conductor on Amtrak San Diegan 587 which I rode five nights a week. He was a true New Yorker and had that authentic New York accent. While Peter loved railroading, his greatest love was the game of tennis. His enthusiasm for the game caused me to get reinterested in the sport. When he talked about tennis his eyes would light up and he had a special glow about him. Anytime I see tennis being played either live or on television, I will always think of Peter. He would also share special things about New York with me before I took a trip there. He gave me ideas of where to go and places to eat. Thanks to Peter I discovered Boar's Head Deli and their great roast beef sandwiches. Thanks to Peter my opinion of New York City was changed from one of dislike of New York City to one of a love for the Big Apple. For that Peter I will always be in your debt for that. Peter was a true and dear friend I who I will miss most dearly.